One of the interesting and challenging theological questions the church must wrestle with is the relationship between the church and the state – governments at the local, state, and federal level. It is an interesting question because that relationship has not been the same throughout history. And it profoundly affects our sense of mission as a church. During the first few centuries of the Christian church, the church was sometimes in opposition to the Roman Empire in which it got its start. When the church proclaimed, “The Realm of God is at hand,” it suggested that the realm of Caesar was passing away and being replaced by something better. The emperor at times demanded absolute loyalty from his subjects, and required them to make sacrifices to the gods of the empire for the success of the emperor. But when Christians made the simple declaration of faith, “Jesus is Lord,” that was a challenge to the authority of the emperor. Church and state were in opposition. Christians sometimes paid with their lives for claiming Christ as their ruler. Many Christian refused to fight in the Roman army because of their belief in non-violence. So the Roman Empire outlawed Christianity and sometimes persecuted the early Christians. I once heard that what started to make Christians more accepted in the empire was when they started to work their way into the bureaucracy as civil servants, and they were so valuable because of their honesty! If only believers were still known for their values like that! In the fourth century, the Roman Emperor Constantine – for reasons that are still somewhat a mystery debated by scholars – declared that Christianity would be the official religion of the empire. From that time on, the church and the state became much more intimately interconnected. It had some good consequences: Christians were no longer persecuted; church buildings were constructed for the first time. But other aspects of this new relationship were not so good in hindsight. Minority religions (like Judaism) were oppressed. Wars were fought in the name of Christ. The Pilgrims who came to North America on the Mayflower left the Church of England in part because the bishops who had charge of their churches were often political appointees rather than real men of faith. In the 20th century, the church in Germany was run by the Nazi government, and supported the program of Hitler. It is not always a good thing when the church and the state become too closely aligned. When the United States was founded, it set about to disentangle the church from the state. The Constitution of the United States says that “no religious test shall ever be required as a qualification to any office…” of the United States. And the First Amendment says that “Congress shall make no law respecting an establishment of religion, or prohibiting the exercise thereof.” Our government is not supposed to give preference to one religion over another, or over people of no religious belief. That is why we no longer have mandatory prayer in public schools — a good thing, in my opinion. It may be possible that the men who crafted and signed the United States Constitution and Bill of Rights never imagined their nation would someday have citizens who were Muslim or Buddhist or Wiccans. But the effect is that our government is officially neutral toward religion. Our Constitution and its various amendments say nothing about whether religious groups can take stands on political issues, parties, or candidates. Many people might be surprised to learn that. But churches and other religious groups are eligible to be exempt from paying taxes. Our church does not pay property taxes or sales tax. But in order to be tax-exempt, a religious group is required by the Internal Revenue Service to be essentially politically neutral; it cannot officially advocate for one political party over another, or one candidate over another. 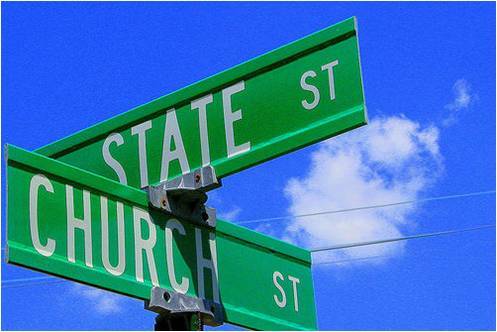 So what should be an appropriate relationship between the church and the state; between God and country? I have found the writings of theologian Walter Wink to be helpful. The New Testament of the Bible, in several places, refers to “principalities” and “powers.” It doesn’t really say exactly what these things are. But Walter Wink sees them as being the rulers, and the great institutions of our society. The Powers are things like businesses, political parties, governments and their bureaucracies, and perhaps even religious bodies. And following that pattern, we as Christian might affirm that our nation is good. It – and other nations – are instituted by God to carry out necessary functions for the common good: defining who governs and how, providing for a common defense from enemies, enacting and enforcing laws, providing for economic trade. And as far as nations go, this one is potentially one of the best – with its democratic system of government, its protection of basic rights, its judicial system that is supposed to presume innocence until guilt is proven, and its separation and balance of powers among three branches of government. That is indeed something to celebrate on this Independence Day weekend! But the various Powers of which Walter Wink writes, including our government, are institutions created by humans and carried out by humans – fallen, fallible, sinful humans. And because of that, the Powers are also fallen. They are not perfect. We have seen elected officers of the government convicted of crimes and imprisoned. Much of this beautiful land in which we live was taken from previous inhabitants. Our nation was built in part through the labors of slaves and immigrants who were never fairly compensated for their work. The life, liberty, and pursuit of happiness that our Declaration of Independence claims are “unalienable rights” endowed to all men (!) by our Creator, have been denied to people of color and women and others. We have fought noble wars for liberty, but also not-so-noble wars for economic benefit. Martin Luther once said that “Christians are simultaneously saint and sinner.” They are both good and fallen. In a similar way, as one of the Powers of this world, our nation is both good and fallen. It seems to me that many people have trouble holding those two truths together. But as Christians, I believe that is the proper understanding of our nation. The good news is that the Powers (our nation included) can be redeemed. Part of that may have to be God’s doing, and we can assist by praying for our nation. But part of that work belongs to us. As people of faith, we are asked to learn to see the truth about our nation – its goodness and its fallenness. We can celebrate the good. But we must also work to improve those parts that fall short of our calling. So much of our political decision-making seems to be based on what is good for me and mine. As people of faith, I believe we are asked to see our nation and world through “God’s view glasses.” Are we living up to the founding vision and our highest ideals? Are the benefits of our nation available to all? Are the poor and vulnerable protected and cared for? And if not, are we working to make things better? Those were the kinds of questions the prophet Amos was asking of King Jeroboam and the leaders of Israel – a “kingdom under God.” As American Christians, I believe we don’t have to make America Christian; instead we need to practice our Christian values as American citizens. Many of you know that as your pastor I haven’t been a big fan of singing patriotic songs in worship. We are here to worship God rather than the human institution that is our nation. They are not the same. And I do not believe that God approves of everything America and Americans do. But one song that we will sing shortly expresses what it should mean to be a person of Christian faith in America. “America! America! God mend thine every flaw.” Ours is a good nation. Ours is a flawed and fallen nation. May God mend our defects and deficiencies. May we play our part in the mending! This entry was posted in Sermons on July 11, 2015 by lyonsvillechurch.